Mary Robinette Kowal stunned readers with her charming first novel Shades of Milk and Honey, a loving tribute to the works of Jane Austen in a world where magic is an everyday occurrence. This magic comes in the form of glamour, which allows talented users to form practically any illusion they can imagine. Shades debuted to great acclaim and left readers eagerly awaiting its sequel. 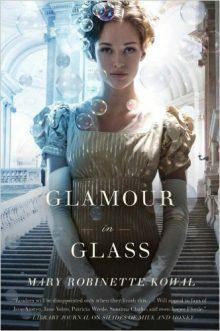 Glamour in Glass continues following the lives of beloved main characters Jane and Vincent, with a much deeper vein of drama and intrigue. Left with no outward salvation, Jane must persevere over her trying personal circumstances and use her glamour to rescue her husband from prison . . . and hopefully prevent her newly built marriage from getting stranded on the shoals of another country’s war.